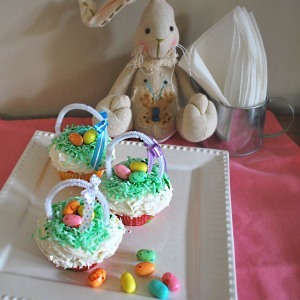 Toddler Recipes: Make Cute Easter Basket Cupcakes! Filled with Jelly Beans...Perfect for Easter! 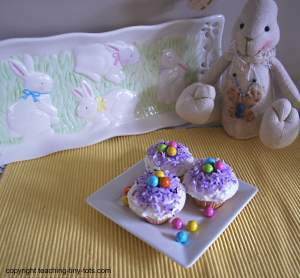 Fun to make Easter basket cupcakes with candy treats. Place white coconut in small ziplock and add a drop of food coloring. Shake bag up and down to spread color. Add another drop if desired. Use frosting or Wilton Icing to hold eggs in place. Place candies inside of nest. Tie ribbon on pipe cleaner and cut bend in an arc. Cut to desired length leaving about an inch on each side to poke into cupcake. Licorice strings are hard to find but can be used for the basket handle. If you are doing this activity with young children, then make the handles ahead of time. We made some mini sized cupcakes which we decorated similar to above with a different colored coconut. We used small sixlet candies for these. Cute even without the handle and very easy to decorate. Perfect size for younger toddlers! !